Biological Consequences of Low-Frequency Sound. Infrasound has long been associated with futuristic weapons and as such has fallen into some degree of disrepute. Infrasound and low-frequency sound, have long existed in the natural environment. Biological evolution has occurred within this acoustic environment, so is there any evidence of adverse consequences? In recent times, technology has been responsible for a significant increase in low frequency sound within the environment in which we live. Anecdotes abound reflecting the deeply-held perception by some ‘sufferers’ that infrasound adversely affects human health. Animals also exhibit similar adverse physiological and behavioural effects. 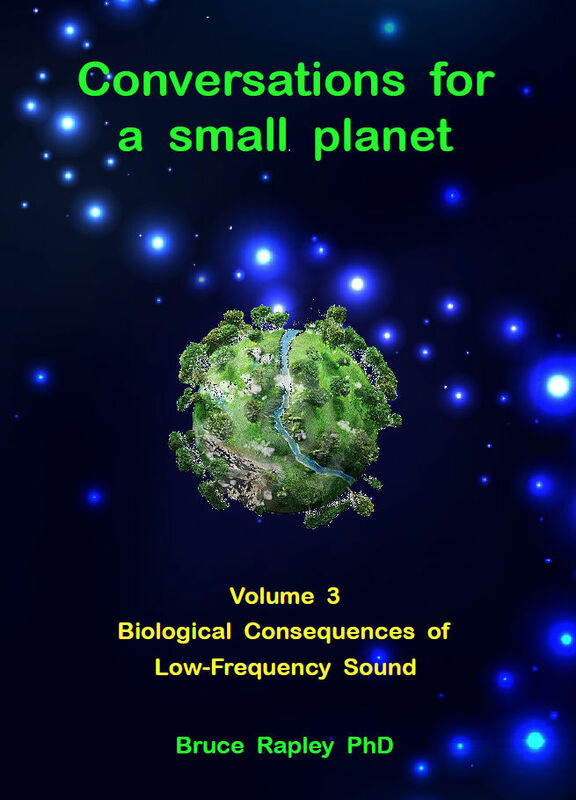 In “Biological Consequences of Low-Frequency Sound” the author reviews the evidence and explains the latest scientific findings which point to real biological, cause and effect, mechanisms. Dr. Rapley is a scientist specialising in applied biology with a special interest in humans and the environment. He has written scientific papers on topics as diverse as bioelectromagnetism and the health effects of wind turbine installations, as well as three books on topical issues in science. Our first book was released in 2010, it is a monograph entitled "Sound, Noise, Flicker and the Human Perception of Wind Farm Activity". Please contact us by email to order a copy, or use the paypal link below. The "Excerpts" link at left takes you to the first pages of all chapters. The explosion of wind farms worldwide has brought with it a rising tide of resistance from residents near them. Complaints about noise and flicker, as well as health problems such as sleep disturbance, headaches, dizziness, anxiety and depression, are all strikingly similar. Developers are advised by experts that the noise levels are virtually undetectable and so low that sound cannot directly cause these symptoms and that these people are naturally anxious. Why is there such a disparity between the perception of the issue from the two groups? Part of the problem is that the physics of sound and the human perception of noise are still not well understood by many. There is a great difference between being able to measure something and a person's perception of it and the variation between individuals is never well accounted for by a statistical mean. This can split communities into the affected and the unaffected, the latter group who, due to no fault of their own, cannot understand the views of those who complain. Yet, for those adversely affected by the wind farm placement, there is no doubt about the intrusion into their lives. This Review brings together the many threads that are needed to explain these issues as a series of Papers from experts dealing with issues of human perception of wind farm noise and flicker. The intent is to make this material accessible to the layman, so many of the papers have extended introductions to the subject areas.